Today the company is announcing new original programming that puts users inside the story. Is it prestige TV, social storytelling, or a whole new medium? I’m standing on a beach, and a group of beautiful twentysomethings gather round a bonfire. There’s Dylan, a passionate dreamer, who strums at an acoustic guitar in his millennial pink hoodie. And Summer, she’s an ambitious life-lover, who dons red Chuck Taylors that match her jacket. I know their names, and their personalities, because their backgrounds float right over their heads. And in case I hadn’t made it clear, I’m not actually on the beach in Orange County. I’m standing in my basement, viewing the scene through a Snapchat AR “portal,” which immerses me in a 360-degree moment that feels like a cross between a chill beach party and a trailer for some new MTV reality show. This effect is by design. The experience I’m previewing is part of a new Snapchat show called Endless Summer, produced by Bunim-Murray, the same production company that brought us The Real World. It’s all part of Snap’s continued obsession with leveraging its own interactive, social platform to push the nature of programming forward. This week, Snap is unveiling its biggest initiative in original programming yet. 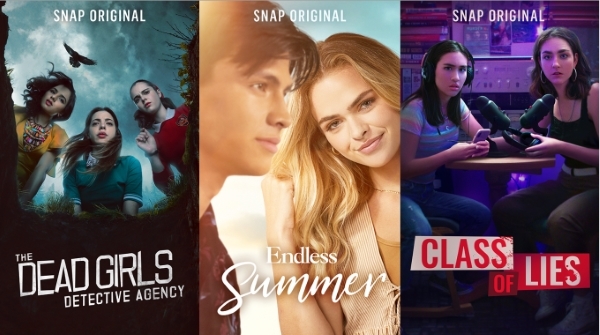 Dubbed Snap Originals, it includes a dozen new shows produced specifically for Snap, ranging from a horror anthology, to a mysterious campus mystery created by a writer on Riverdale, to a docuseries about drag queens who are coming of age. Snap’s own content hasn’t all been a hit–following a controversial redesign, especially, its publishers reported losing views. But over the last two years, it’s become a successful platform for the company that Sean Mills, head of Original Content for Snap, is quick to point out mirrors the habitual viewing style of TV audiences, rather than the viral one-offs of YouTube. SportsCenter’s show on Snapchat reaches 2.5 million viewers, and NBC News’s audience has doubled on Snap over the last year, from 2.5 to 5 million viewers a day. That’s a small cry from Snapchat’s 188 million daily active users worldwide, but puts NBC’s Snapchat viewership on par with a hit cable show. With its new content push, Snap doesn’t want to just duplicate TV shows or Netflix binges, though. For whatever position its stock might be in, Snap wants to do something more ambitious: Push the medium of storytelling forward, leveraging its AR breakthroughs and social platform to do so. The aforementioned Endless Summer portal is a step toward just that. Snap’s own engineers worked with the show creators to film a 360-degree video scene, then beefed it up with dimensional audio and graphics that allow someone on Snapchat to walk through the scene as if they’re inside of it. Done right, Mills imagines these scenes won’t just be one-off promos, but integral to experiencing the story. For the Snap Original Class of Lies, the portal takes a different form. It’s not a filmed scene, but a completely digital environment like a video game, allowing you to explore the dorm room that the show’s protagonists inhabit, moving your phone close to surfaces to inspect photos or other set pieces for clues. The technology builds upon Snap’s runaway success with its AR face filters and World Lenses. But the company wants to think beyond puppy-dog selfies and explore how that fundamental technology can create the next, must-see experiences online. For now, you’ll walk into these portals by swiping up at a key moment in the show. But if Snap finds that these portals are engaging its audience, the company imagines that they don’t need to be complementary to programming; they could be the programming itself. Of course, Snap isn’t just after novel experiences; the company needs to leverage shared experiences to keep its users ping-ponging around the app. Another new interactive element it’s introducing is for reactions. Much like people film reaction videos to various shows and memes on YouTube, a pivotal scene in Endless Summer will prompt the user to swipe up to film and share their reaction–green-screening their face onto the Endless Summer backdrop. It’s an example of how powerful Snap programming can be since it exists in such a self-contained platform, where media consumption and creation can be blurred into one in the same thing. Snap can become not just a content channel, but the place you talk about the content. It’s like folding HBO’s season finale of Game of Thrones into Twitter–where fans are talking about wtf just happened to Jon Snow–into one platform. This combination is powerful, because Snap can work with show creators to build a moment of programming worth sharing–then make it sharable. Indeed, if one thing is clear from talking to Mills during the development process of Snap Originals, it’s that Snap knows some of its ideas might fail. But the company still recognizes that it has the most mature platform to push mobile storytelling forward in new, interactive, weird, and perhaps irresistible, ways. That is, as long as Snap’s users like what they see.